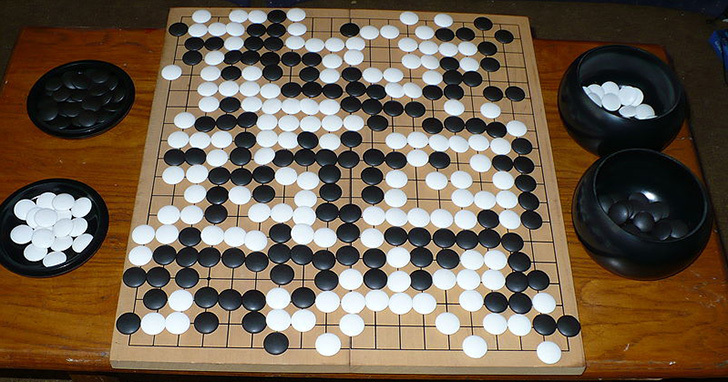 GO is an abstract strategy board game for two players, in which the aim is to surround more territory than the opponent. The game originated in ancient China more than 2,500 years ago, and is one of the oldest board games played today. It was considered one of the four essential arts of a cultured Chinese scholar in antiquity. The two players alternately place black and white playing pieces, called "stones", on the vacant intersections ("points") of a board with a 19×19 grid of lines. Beginners often play on smaller 9×9 and 13×13 boards, and archaeological evidence shows that the game was played in earlier centuries on a board with a 17×17 grid. 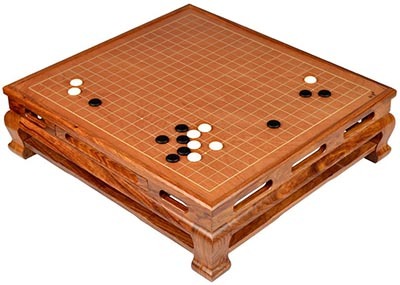 By the time the game had spread to Korea and Japan in about the 5th and 7th centuries CE respectively, however, boards with a 19×19 grid had become standard. The objective of the game - as the translation of its name implies - is to have surrounded a larger total area of the board with one's stones than the opponent by the end of the game. Once placed on the board, stones may not be moved, but stones may be removed from the board if captured. This is done by surrounding an opposing stone or group of stones by occupying all orthogonally-adjacent points. The two players place stones alternately until they reach a point at which neither player wishes to make another move; the game has no set ending conditions beyond this. When a game concludes, the territory is counted along with captured stones and komi (points added to the score of the player with the white stones as compensation for playing second) to determine the winner. Games may also be won by resignation. As of mid-2008, there were well over 40 million Go players worldwide, the overwhelming majority of them living in East Asia. As of December 2015, the International Go Federation has a total of 75 member countries and four Association Members covering multiple countries. Buying Go Equipment and Supplies - American Go Association. Go Game Guru - "The World's Specialty Go Store." Go sets, boards, stones & bowls. List of professional Go tournaments - Wikipedia. World Amateur Go Championship - international tournament for amateur Go players, held once a year since 1979. The organising body is the International Go Federation (IGF). Go magazines - Sensei's Library. After AlphaGo, what's next for AI? - The Verge. 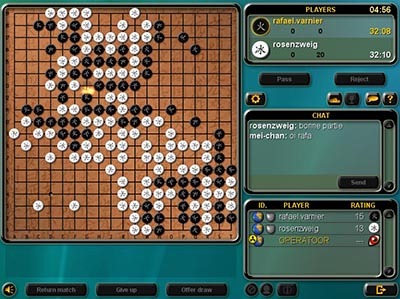 AlphaGo - computer program developed by Google DeepMind in London to play the board game Go. In October 2015, it became the first Computer Go program to beat a professional human Go player without handicaps on a full-sized 19×19 board. 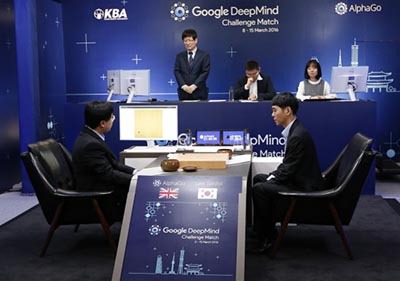 In March 2016, it beat Lee Sedol in a five-game match, the first time a computer Go program has beaten a 9-dan professional without handicaps. AlphaGo Zero: Google DeepMind supercomputer learns 3,000 years of human knowledge in 40 days - The Telegraph. 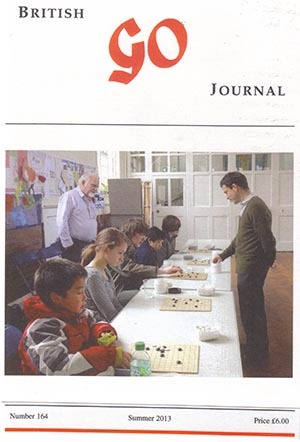 AMERICAN GO ASSOCIATION | AGA - since 1982. Benson's algorithm (Go) - Wikipedia. Deep Blue (chess computer) - Wikipedia. Deep Blue developer speaks on how to beat Go & crack chess - The Verge. Deep Thought (chess computer) - Wikipedia. DON’T FREAK OUT OVER GOOGLE’S AI BEATING A GO GRANDMASTER. IT’S A GOOD THING - Wired. Games played with Go equipment - Wikipedia. Go opening strategy - Wikipedia. Go opening theory - Wikipedia. Go ranks and ratings - Wikipedia. Go strategy and tactics - Wikipedia. Go Teaching Services - British Go Association. Google vs. Go: can AI beat the ultimate board game? - The Verge. Google’s AI Takes Historic Match Against Go Champ With Third Straight Win - Wired. Google's Deepmind AI beats Go world champion for a second time - engadget. International Go Federation | IGF - since 1982. Lee Sedol - South Korean professional Go player of 9 dan rank. List of Go organizations - Wikipedia. List of Go players - Wikipedia. List of Go terms - Wikipedia. List of top title holders in Go - Wikipedia. Rules of go - Wikipedia. South Korean Gets ‘Priceless’ Victory Over Computer in Go Match - The New York Times. THE INTERACTIVE WAY TO GO - "Here, you can surely learn to play Go because you can actually play." The Sadness & Beauty of Watching Google’s AI Play Go - Wired. Why is Google's Go win such a big deal? - The Verge. Go On the Internet - American Go Association. Go-Playing Programs - list of computer programs that play go. Improve your game of Go (or just keep playing) with this collection of apps - Macworld. Internet Go server - Wikipedia.